According to the McKinsey Solutions Climate Desk, all LULUCF and agriculture measures have full global technical potential of 2.6 GtCO2e per year by 2030, 12.46 GtCO2e less than projected BAU levels or equivalent to an 82.7% reduction. However, this includes emissions related to short-lived gases. Removing levers associated with short-lived gases, full global technical potential is 4.37 GtCO2e per year worldwide by 2030, 10.69 GtCO2e less than projected BAU levels or equivalent to a 71% reduction. Of this, agriculture contributes a reduction of 3.53 GtCO2e while forestry contributes 7.16 GtCO2e reduction. Removing impact of short-lived gases. Land-related GHG emissions include carbon dioxide (CO2), nitrous oxide (N2O), methane (CH4), perfluorochemicals (PFCs), hydrofluorocarbons (HFCs) and sulfur hexafluoride (SF6), this section focuses only on CO2 and N2O emissions. For strategies that included components of the short-lived gases, a percentage (?) of emission reduction was subtracted based on percentage breakdown of emission types per activity. Our analysis generates emission levels of 10.68 GtCO2e worldwide by 2030, that is a 29% reduction from projected BAU emissions for 2030 or a potential abatement of 4.89 GtCO2e. 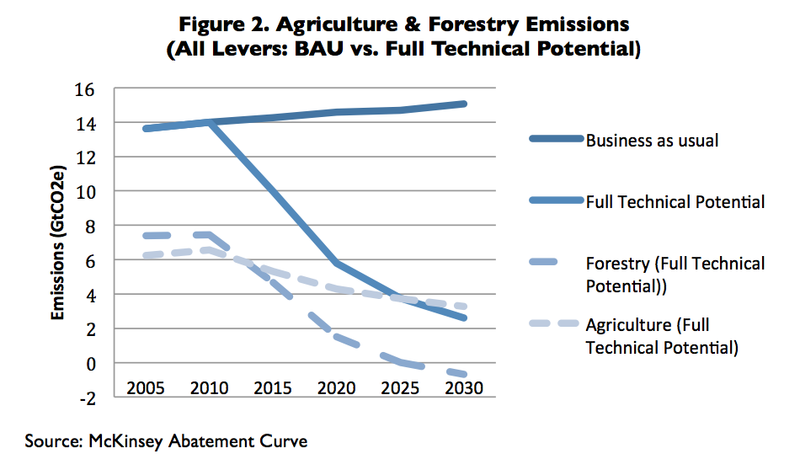 As seen in the table above, the gap between full technical potential and our proposed potential is largely due to the forestry sector. This is partly due to the significant reduction of greenhouse gases from agriculture relate to short-lived gases, but also demonstrates the tremendous importance forests play in the fight to reduce GHG emissions. Ellison, David et al. “The Incentive Gap: LULUCF and the Kyoto Mechanism Before and After Durban.” Global Change Biology Bioenergy. Vol. 5. Pg. 599-622., Oct. 16, 2012. The percentage of emissions per activity that comes from short-lived gases.